The Liberal Party once announced its latest plan that they plan to endorse Agot Isidro for the vice presidency after she has served three years in the Senate. 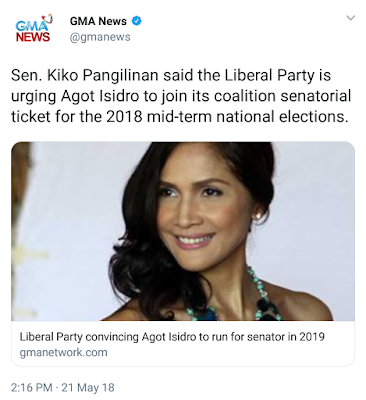 Both Hillary Rodham-Clinton and Loida Nicolas-Lewis have announced that aside from the planned Kris Aquino presidency and the Leni Loud Robredo transitional presidency -- that it's time to settle for an Agot Isidro vice presidency. "I believe that Kris Aquino's partner to help restore democracy in the Philippines will be Agot Isidro. She is the most vocal critic against the dictatorship of President Duterte. Both me and Hillary have thought it through to give Kris the best vice president we can come up with. Three years serving in the Senate from 2019 up to 2022 will give her the experience she needs to run the country." said Lewis in an interview at CNN. Kris Aquino who once denied any plan to run for Senator and previously turned her back on the Golden Age Project just said on an interview with Maria Ressa, "If the Philippine democracy is dying, if I'm the only one who can restore it. So be it. I respectfully accept that Agot Isidro will be my best running mate for the #BabaeAko campaign."